The integration of information and communications technology into a wide range of industries, including health care, education and security, is expected to create a great deal of opportunities while bringing revolutionary changes to people’s lives. SK Telecom, Korea’s largest mobile carrier, is envisioning such a connected future with a new type of economy created and powered by ICT. The company’s chief executive Ha Sung-min’s so-called “ICTnomics,” coined from the words ICT and economics, aims to bring closer the era of a hyper-connected society in which all things are connected through mobile gadgets both in reality and virtual reality. Also, a highly advanced artificial intelligence will soon be developed and deployed so that electronics can think like humans and communicate with them. 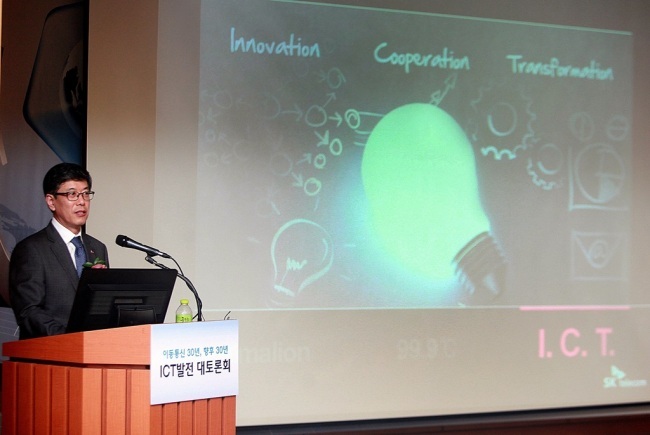 “ICT in the ICTnomics era is not just about technology but means innovation, cooperation and transformation,” the CEO said at a recent tech conference in Seoul. The 5G mobile network and the Internet of Things will serve as company’s backbone in the coming years, noted an SK Telecom official. “As ICTnomics requires hyper-fast and hyper-connected networks, SK Telecom will pick up the pace in adopting the 5G mobile network,” the official said. The 5G network, which can reach speeds of 100 Gbps, is 1,000 times faster than the current Long Term Evolution. The Korean telecom firm will showcase the faster mobile network in 2018 during the Pyeongchang Winter Olympics, with the aim to commercialize the mobile services by 2020 to become the first 5G network operator in the world. The faster network will act as a catalyst for the development of the world’s ICT industry and convergence among different industries, SK Telecom said. SK Telecom also plans to create business models for the IoT, combining various industrial sectors such as health care and security. The IoT industry is expected to create an economic value of $14.4 trillion between 2013 and 2022, according to the firm. The company has been developing IoT products and solutions such as smart tachographs and black boxes for vehicles, and street lighting controls. Using its expertise in the IoT, the company will release various other new products and solutions this year, such as a control system for trucks that transport dangerous substances.